I should admit before we start that I have never seen an episode of Oprah. Clips, yes, like the one where James Frey had to grovel for forgiveness for deceiving Oprah about the veracity of his “memoir” A Million Little Pieces. And yes, I had heard about the strong and scary pull that Oprah has on her audience, inspiring a cult-like devotion that was described long ago by writers funnier than I. The court jester attempts to amuse Her Highness. This show in question, though, nestled in what Oprah says will be her 25th and final season, featured a slow-dance with John Travolta, and Don Johnson returning a pair of rhinestone-studded sunglasses he had had since 1986. Several women in the audience were either shedding tears when these hunks appeared on stage, or at least the footage was edited to indicate a causal relationship. Wow. There is no celebrity who, upon seeing him/her in person, would make me cry. OK, Elvis Presley, but that’s because he’s been dead for 33 years, and if I’m seeing him in person, that means I’m about to have my brains eaten. But John Travolta and Don Johnson? John Travolta who in the last 10 years has made one watchable movie, Swordfish, whose reason for being watchable doesn’t involve John Travolta? And Don Johnson, whose last watchable films were Guilty As Sin and The Hot Spot, both released over 15 years ago and both watchable for reasons other than Don Johnson? The Beatles they ain’t, yet folks were leaking from the eyeballs over them. This paled in comparison, however, to the pandemonium that Oprah would create when she blessed her audience with her most recent gift. Previous seasons’ recipients of her largesse have enjoyed wrapping paper, camcorder, cars, refrigerators, and money. (No virgins yet, not until Oprah begins her quest for eternal life and demands sacrifices of human flesh.) However, as a token of appreciation for her blood-oath loyal viewership for 25 years, Oprah last week gave each member of her studio audience an all-expense paid trip to Australia. Please, please watch this video to see the reactions. 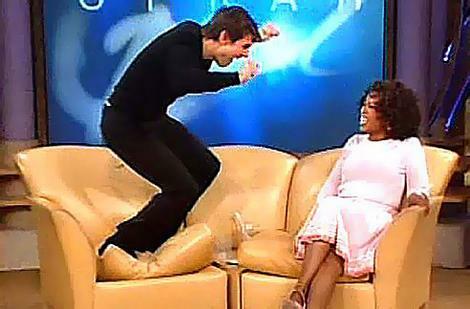 If screams could be converted into energy, Oprah could have powered the world. I have never seen anything like this. I firmly believe that if Oprah had demanded that a toddler in the corner be stoned to death and eaten, a hundred audience members would have been shitting Activia-coated human bone shards within twelve hours. If Oprah had beckoned Thulsa Doom-style to her brood in the upper bleachers to “come to me, my child,” crumpled bodies would have littered the stage floor. Even though he nearly shut down New Zealand, Justin Bieber has a lot to learn from Oprah Winfrey. God help us if he does. I’m not judging Oprah or criticizing her influence and reach. More power to her (well, maybe not, since she has so much already). At least she uses it for good, through charities, non-profits, and even these extremely generous gifts to her audience. But a major pilgrimage to a country that’s mostly desert for her most devoted fans, who would undoubtedly kill—and die—for her, in her “final season”? I would caution anyone taking this trip to Australia to see Oprah off that, if they offer Kool-Aid on the jet, stick with the bottled water.